Just a quick little post on a new product that I think is so simple, yet so innovative. If you have a dog or a cat, you’ll love this product. 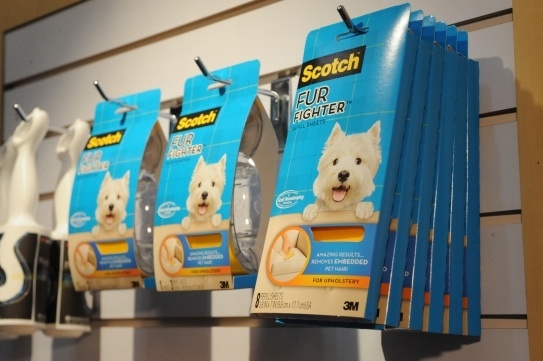 If you’re a marketer, you’ll love that Scotch/3M came out with yet another innovation—another simple innovation. Scotch Fur Fighter. A little device that you run along your furniture (home or car) and it picks up embedded pet fur. The fur that a vacuum just couldn’t seem to pick up, that just sits there no matter what you do to try to remove it. If you’ve got a pet, you know how great that is. I just love that it comes from 3M—the folks that make post-it notes, removable masking tape, adhesive picture hooks, etc. They have done such a great job of creating simple little innovations that really help us in our day to day lives. The matte finish wrapping tape is one of my personal favorites because you can’t see it on top of the wrapping paper. All sorts of products for the home and office that we can use and remove whenever we want. You gotta love it, as a consumer and as a marketer. As a Dog owner who’s pet sheds constantly I picked this up first chance I got. Unfortunately it doesn’t really work, at least on my furniture. I could see it working on a microsuede, but it mainly just scratches at the woven material on my couch leave lots of fur behind. A plastic glove rubbed over the surface of the couch works just as well. This would be a great product IF it lived up to the marketing hype.